This past weekend, J and I were walking around the Kalamazoo Mall killing time as we were waiting for a table at Fandango. We came to an empty store front that had a display in the window for the businesses on the corner of Michigan Avenue and Church Street just a few blocks away. The display had a table with a menu on it for a fairly new restaurant next to the Michigan News Agency. The specialty of this new restaurant, stuffed burgers. 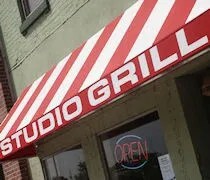 The Studio Grill is a small storefront on Michigan Avenue a few doors down from the Church Street intersection. There’s a red and white awning over the front window that lets you know you’re in the right place. The red and white theme is carried inside the restaurant with red and white checkerboard tablecloths on all the tables. The hardwood floors and solid wood chairs add to the down home feeling of this true mom and pop restaurant. We were a little bit later getting there than we planned on. During the week, the Studio Grill is open until 3:00. We had planned on a true lunch, but J worked late and it was closer to 2:00 by the time we made it in. There was one other table in addition to a few take out orders so we weren’t the only ones eating late. There is a lunch counter in the middle of the space as well as a coffee bar. The Studio Grill is a true diner. They have a wide variety of on-the-go coffee drinks and pastries as well as a full breakfast and lunch menu. Like any good diner, breakfast is served all day. The waitress, who is also one of the owners, saw us sit down and asked for drinks. We both got Coke Zero’s which was on fountain. The paper menus are already on the table so by the time the drinks came, we had made up our minds. The waitress went over the specials for the day which both sounded good and explained to us how their burgers are made. All of the stuffed burger creations are her husbands. If none of those float your boat, there’s also a build your own option. The special for the day was Black ‘n Bleu burger. That’s usually something I jump on, but there was a burger on the menu that also sounded a delicious. I went with the Texas Tank. The burgers are all fresh ground beef and this one is stuffed with a Serrano sauce and pepperjack cheese. It’s then topped off with home made chili and cheddar cheese. The creation is served on a toasted bun and can be served with sour cream if you choose. One thing that is served with it is extra napkins. The burger was delicious. I expected it to be a little spicy, but it was actually pretty mild. The burger meat was great. 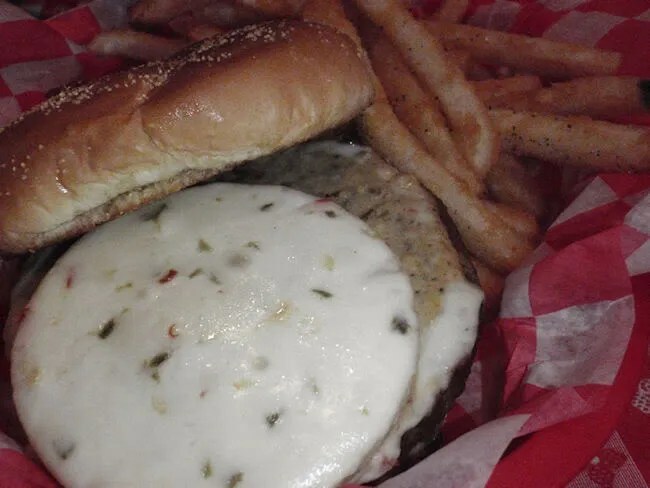 The fresh ground burger was falling apart and oozing with the pepperjack cheese that was stuffed in the middle. When the basket was set down in front of me, I was wondering how I would ever fit it in my mouth, but it smooshed down pretty well and wasn’t much of a problem. 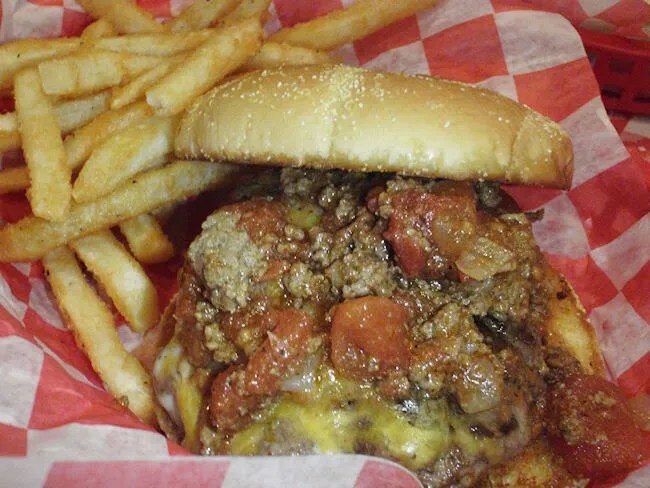 The chili did drown out a little of the burger flavor, but that’s not a bad thing. I’ll just have to go back and try another burger. J surprised me and also went with a burger. Before we ordered, the waitress told us the menu was just a guide. As long as they had an item, they would make it and that helps with making all of their creations vegetarian or vegan. J ordered the Sweet-Spicy Pineapple Burger with a veggie patty in place of the ground beef. After ordering, the cook, also an owner, came out and told her he couldn’t stuff a veggie burger so the toppings would all be on top. That didn’t matter to her. The veggie patty is topped with pepperjack cheese, roasted Serrano peppers, and grilled pineapple. It’s served with a mango salsa on the side. J loved the burger. She said it was pretty spicy from the cheese and the peppers, but it had a really great flavor. She was a big fan of the cheese which was actually melted on top of the pineapple and patty. She said too many times the cheese doesn’t get melted on veggie burgers, but this one looked like it had been steamed on the flattop after it was grilled. There was a delicious ring of griddled cheese the circled the burger. Both our meals came with fries which, again, were delicious. They had a light breading to them and they were very crispy. Our bill was only a little over $16. It’s not many places you can get such a unique burger for that price. 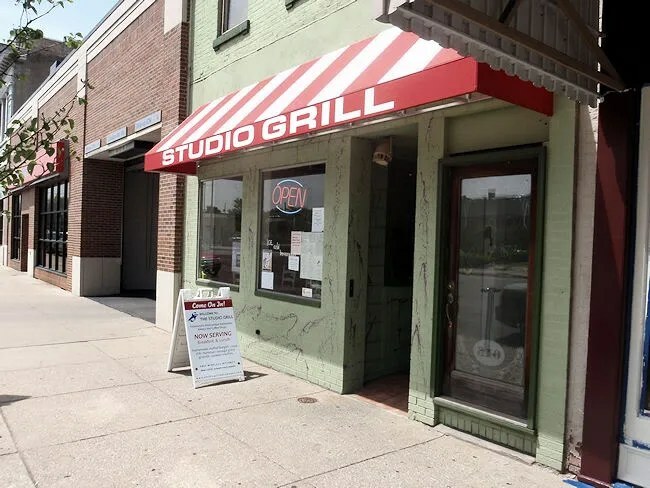 The Studio Grill is carving out a niche for itself on the edge of Downtown Kalamazoo. The stuffed burger is nothing new, but you don’t see a whole lot of places doing it. It’s big in Minnesota where the Jucy Lucy is the king of burgers, but outside of there, it’s something that has been left to home cooks for too long. Breakfast or lunch, give Studio Grill a try. I ate at the studio grill today and the food was great, but i think the waitress was high out of her mind. First of all she never introduced her self. Secondly, she said she forgot what the soup of the day was. She never refilled the drinks or asked how the food was. The first thing she said when she came to the table was and I quote ” Credit cards. I was like a beautiful flow of credit cards.” . I am not quite sure what all that was supposed to mean. She was nice, but as a server i have to say any extra curricular activities you might engage in should not be noticeable to a guest. She also never brought the check, i had to go to the cash register to wait to be noticed and then helped. I left a 15% tip on the already discounted bill ( i received a student discount), I typically tip about 30% because i myself am a server, but the service was negligent, unprofessional and confusing. I will return because of price and good food but if i recieve the hippie dippy service a gain i will not go back.